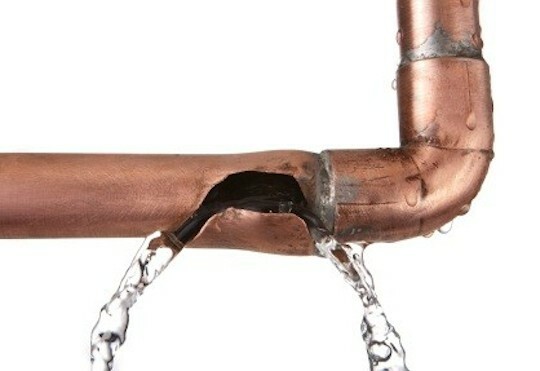 No homeowner ever wants to discover a water pipe has burst, since the leaking water may do a significant amount of damage to the surrounding area and the fix may be very expensive if a professional plumber needs to be called. Pipes burst because of the nature of freezing water and the structure of the materials used to construct water pipes. It is possible to prevent, in some cases. The good news for homeowners is that most pipes are protected from bursting because they are either covered with insulation or located in areas that rarely if ever reach the freezing point of water. There may be sections of piping that are routinely exposed to freezing temperatures or could be compromised if the insulation fails, however. These pipes break because the air temperature causes the water to freeze along the inner walls and create a blockage. The pressure of the expanding ice on a weakened section of pipe combined with the pressure of flowing water backing up behind the blockage can cause a break without warning. There is a reason why many professionals recommend leaving a trickle of water flowing through home faucets during cold weather. If water is allowed to remain still in a pipe exposed to the cold air, the water may freeze solid and the pipe may burst. If the water continues to flow, even in a trickle, it won't have the opportunity to freeze and the pipes should survive until the air temperature warms above freezing. When pipes burst due to freezing, the homeowner may not realize it until these is a flood or the overall water pressure is reduced. It is important to keep water flowing through pipes during cold weather, although hot water pipes may resist the freezing process better than cold water pipes. If pipes burst due to freezing, homeowners may want to shut off the main water supply to minimize future damage and call a professional plumber as soon as possible to find the leak and repair the damage.